It was my Mum’s birthday the other weekend and, ‘like Mother like Daughter’, she had a fancy dress party. The theme was 1963, the year she was born. As I was planning my outfit in the weeks before it got me thinking. What does 1963 mean to me? I hadn’t thought about it before then. The only thing I knew was Dirty Dancing was set that year! So we rocked up to the party in Nottingham, myself dressed like something from the front cover of Vogue (well tried to!) and the wife in a random 1963 high school graduation T Shirt with. We were ready to see what the early years of the 1960s meant to the rest of the party guests. My Grandma saw 1963 as the time she had to go to school and so after going to M&S was transformed to her younger years with full school uniform in green and white, safety pins and all. Other family members saw the early 1960s as the Beatles, coming as themselves (as they are in their 60s) and some went late 60s, the peace years! For my Nana and Grandad it was the year they had their first daughter. 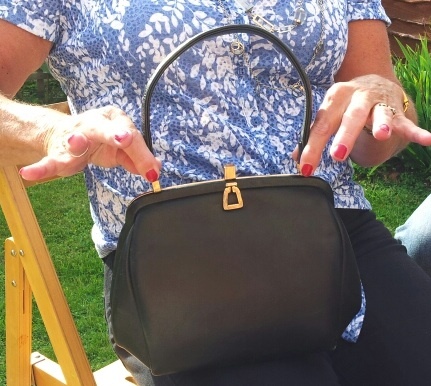 As soon as my Nana’s sister arrived I spotted she was armed with an amazing handbag. Naturally I needed to know more. She explained her husband had brought it for her before they were married. How great that she still had it. I did hint but I had no luck getting it from her! The biggest lesson of the party was not the outfits but the fact I am going to turn into my Mum! As photos were shown around of her as a little one both my wife and brother couldn’t get over the similarities between us. I guess it happens to us all. On the subject of family I did manage to pop into a few shops while in Nottingham and came across some old photos outside a record shop. It made me feel sad that these photos were not in an album with the right owner. They are part of someone’s family history that should be passed down to the next generation. I bought them because I couldn’t leave them in a box unloved. So I want to share these with you as the fashion is great and there are some really nice scenes. In the end the trip to Nottingham left me thinking about family and how years go by so quickly. I wonder if I will have a 1982 party when I turn 50! I also hope maybe someone reading this will know some of these people in these pictures. You never know….